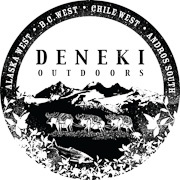 Once, when I was in Alaska, I was casting into the surf, just to see if I could entice a passing salmon or two. I was delighted when I felt the undeniable pull of a fish and I quickly reeled up my prize onto the sandy beach. The thrill turned to shock when I got a good look at my bounty. If my over-active imagination serves me correctly (and it’s had several years to over-exaggerate the situation), when that fish looked up at me it’s gills flared out with razor fish spikes and countless whiskers protruded from the sides of it’s huge mouth. As that fish glared at me, the razors and whiskers waved around just daring me to retrieve my spendy lure. I’m also pretty sure it hissed at me. That single ocean surprise fish became a star character in some reoccurring nightmares. This is the entry where I risk displaying my true feminine side by talking about the looks of certain fish. This of course could be a me thing and surely no one else out there is phased by the appearances of fish, but there are a few species that give me the heebie jeebies. I’m pretty sure my aversion to certain fish started at a young age. I believe I observed as a young thang, that say, a sucker, was properly greeted by revulsion and dismissed with a mandatory rock or two…Please remember, that was back then, before being politically fish correct was the right thing to do. As for what to do with a sucker fish in this day and age. No comment. It’s a lip thing. The slurping bottom sucking pucker that makes me recoil and cut my line before I’d attempt to go in for a fly retrieval– even IF it was a favorite fly.. (Girlie Alert!) Yep, that’s right, I have my limitations on the guyish bravado front and I draw the line at sucker fish. The few times I’ve accidentally caught one I was appalled and quite frankly embarrassed through my trout heart that such a slimball crashed my fishing party. I’m pretty sure I can blame suckers for my aversion to the whitefish. It’s the lip thing again. Their small rounded little fish lips are a visual reminder of all things sucker fish and distinctively non-trout-like. My prejudice is irrational, but drawn around a solid circle factor. Trout have good lips, nice smile, straight teeth. Just saying…. When I judge a fish by it’s looks, it’s not limited to just the lips. There’s the whisker issue to mention. I’m not sure why or when I took a disliking to the fish with whiskers, but on the whole, I’d rather not. The way I see it, moving whiskers that give out a grabby tentacle vibe should be avoided if possible. Basically, you’ll never hear a catfish report out of me. Now, just to be clear, a website is one place to confess all sorts of shortcomings. However, when I’m out on the water and find myself in the unfortunate situation of having an undesirable at the end of my line, I do remain stoically composed. Solid pride dictates a calm demeanor, play it cool and zero involuntary dry heaving motions are allowed, especially in the presence of (male) witnesses. I would never, ever…..
Ah Rebecca, even the ugly fish need to eat too. Here in Florida, we have our fair share of “garbage fish” Nothing can make you curse more than having something pull hard yet when you see it, it’s a stingray the size of a car hood, or a super slimy sail cat fish. These don’t trump the always dreaded lizardfish which looks just like it’s named but has teeth and a nasty disposition….and some folks consider a ladyfish a trash fish, but I rather like catching them. They’re a smaller cousin of tarpon and leap when hooked. But, 99% of these can be avoided by fly fishing. And using rocks to unhook a fish? C’mon Rebecca…..how “girly” of you. Were you using a pink rod when you caught it? Ummm…the rocks weren’t used to unhook the fish……..
Yeah, it makes sense to me. Lotsa people I know extoll the virtures of fly fishing for carp. Now, that’s an ugly-assed fish. I accidentally caught one about a year ago. Pretty solid fighter, which is why my friends like going after them. Hooked it while fishing a nymph for trout in that pool. I turned around to show a friend where a large trout was rising, next thing I know I’ve got a serious fish on…hed to have my friend help me unhook the carp. It’s the lip thing again. Girly has nothing to do with it – ugly is ugly and repulsive no matter how you slice it. I hate hooking suckers (just did that on my last outing) and I don’t like touching the darn things either. And I’m about as far from girlie as the meter can get. And Rebecca – there’s no shame in owning anything pink. If it catches fish, who cares what color it is? Hell, I’d use a pink pole….if anything, just to tweak with people’s heads. Little brains are fun to f*** with. In the case of blob fish, it’s less about lips and more of a bulbous nose thing. Good God that thing is ugly! Ok, lets see now. I remember hooking what felt like a state record Largemouth Bass that turned out to be an ugly Carp caught by the tail. I remember hooking a hefty fish out of Ririe Reservoir that felt like it would tow my float tube across lake. It turned out to be a big ol’ sucker. Disappointments to say the least and double ugly. I hear you my friend. OK, time to weigh in on this one. 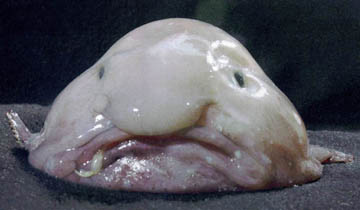 The blobfish is freaking grotesque – I’d probably shoot it, THEN cut the line. Suckers and carp never bothered me – I like the fact that, once you hook a carp, (yes, on a fly) they stay hooked. 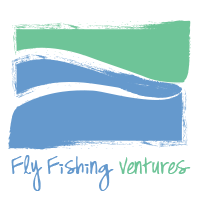 And, if you have a revulsion to carp and suckers, and things slimy – NO BONEFISH FOR YOU!! Eels, however, do gross me out. 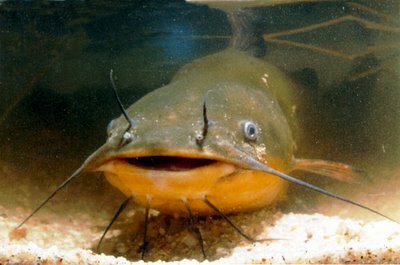 Now, about catfish … We seem to have a differeing of opinion. Now, you’re certainly allowed to be wrong – after all, it IS your blog. But – you’re selling catfish short. Especially flatheads. They are top-line predators, the only really effective way to get them is using live bait, they grow big, and they fight hard. (And, they taste great) And, I actually think they look pretty cool, too. Sturgeon have whiskers, too, and they’re VERY cool. 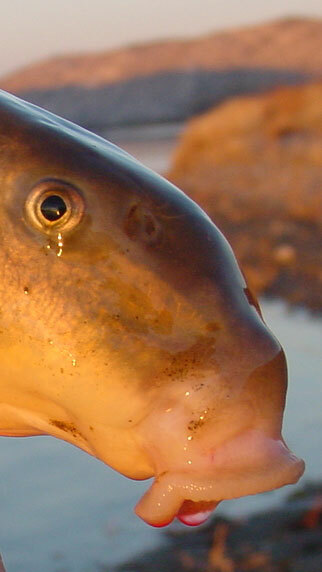 Catfish are tasty, carp are great sport and sucker meat is valuable when sold to bait-fisherman. I got nothing for the blob though. It might just need a hug. There is one fish I can’t stand and it’s not that it grosses me out. I just plain don’t like bullheads (black ones I like the least). It’s a combination of always catching them pan fishing when you have your lure set to deep, and the darn spikes in there gills. I can’t tell you how many times they have poked me. The final straw with Bullheads was (I’ll make a long story short) when I was in a small boat I had my flip flops on. I went to put my foot on the fish to take my lure out (because I have had the spikes get my hands too many times) and just as I was going to put pressure on the fish he flipped around and I pressed my toe on to his spike. Not fun!! 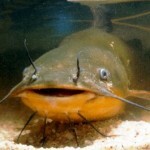 Love your blog, but your irrational prejudice against the noble catfish is difficult to understand. Also, fishing this way saves a lot of $ you don’t have to spend on tackle and flies! @Clif ~ I agree, completely. Nasty fish nose! @Shoreman ~ LOL now that is a memorable teacher! 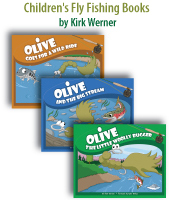 @Lizzy ~ I’ve never caught a Burbot, but I’ve heard rumors. No thanks! Ugly Stik doesn’t have a pink rod yet? You better get after them, they are falling behind the times. @Zach ~ I vote you give it the hug. But you’re right, it does look like it needs alittle loving with that sad, sad face. You know how I feel about “trash fish”- but that blob thing looks like a science experiement gone wrong- part human, part jellyfish, all ugly. AMEN sista !!! You told me Saturday night to look up ‘fish faces’!!!! I feel exactly the same way. I don’t care how special that fly was, if it’s got lips, I don’t want it back!